For a very useful review of what’s known about the extent of economic mobility across time, countries, and generations, read this Jason DeParle piece from this AM’s NYT. I’ll have more to say about this later, but for now, I wanted to amplify one point about something that’s too often misunderstood in these discussions: the negative relationship between inequality and mobility, i.e., how higher inequality—greater distance between income classes at a point in time–can itself reduce the rate of mobility—the ability of families to move across those distances over time. 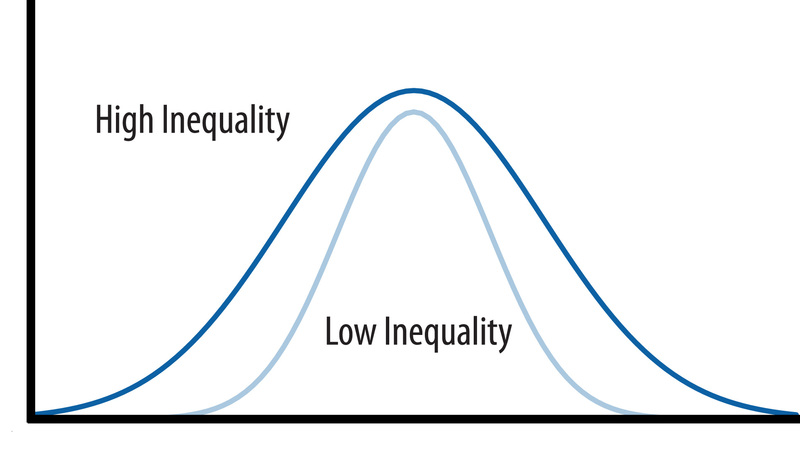 In terms of the causal link between these two dynamics, I’ve stressed issues like access to quality education, better neighborhoods with better resources (libraries, parks, healthy environments)…to the extent that higher levels of inequality separate families along those dimensions, common sense would dictate that such differences map onto mobility differences. The income compression in rival countries may also make them seem more mobile. Reihan Salam, a writer for The Daily and National Review Online, has calculated that a Danish family can move from the 10th percentile to the 90th percentile with $45,000 of additional earnings, while an American family would need an additional $93,000. The graph below shows what’s going on here (hat tip: JC). The figure shows the income distribution of two countries, say Denmark (“low inequality”) and the US (“high inequality”). Suppose we’re measuring the percent of families that move across income fifths over time, say from the bottom fifth of the income scale to the middle fifth. Well, there’s simply a lot less economic ground to cover in Denmark relative to the US. In other words, part of the higher mobility in low-inequality countries is a function of lower inequality itself. It’s easier to move up and down the income scale when “up” and “down” are shorter trips. This simple insight is important, because we hear a lot of conservatives–Rep Paul Ryan, for example–arguing that we shouldn’t worry so much about inequality, because mobility will offset it. First, that’s wrong in ways I note in the link above (we need increased mobility to offset increased inequality, and we don’t see that). Second, as the evidence in the NYT piece shows, we actually have less mobility than other advanced economies. And third, most importantly in my view, increasing inequality itself makes it harder to achieve greater mobility, due both to diminished access to mobility-enhancing opportunities and to the distance problem shown in the figure above. Share the post "Mobility and Inequality"
10 comments in reply to "Mobility and Inequality"
Jared, the link goes to the graphic associated with the article, not the article itself. But thanks for articulating such a simple point! It’s a great way to put the lie to this. I wonder if there’s any way to analyze income mobility leaving aside the super-wealthy. That is, leaving off the knee in the curve, is income mobility still a thing that happens with people whose incomes are below the stratosphere? Perhaps for the bottom 80%, there’s some amount of mobility, but that top 20% remains hard to crack for everybody except some of the fourth quintile. Additionally, is mobility data available for the top 10%, 5%, 1% and 0.1%? That might add a layer to this. Paul Krugman points out that one must be careful in talking about mobility. We generally look at, say, the number of people that move from the second quintile into the third quintile. But the majority of people who make this move go from the 39th percentile to the 41st percentile, ie not changing their incomes much on a relative scale. There was an article recently about Finland’s education system. Their ‘vision’ was one of a purely equal system so there are no magnets/charters/gifted programs and I think they said their are no private for profit schools. Its not surprising a culture that can put an education program like that in place can be one of the most mobile and equitable societies. I think a system with high inequality but high mobility would have horrible consequences. While it might be great for someone making $20k to start making $2 million, imagine the impact on people of the reverse movement? The problem becomes worse when we view education, credentials and skills as the tool to aid mobility – those things are expensive and time-consuming. Imagine 4 years of education, cost of $100k, gets you a $120k job but then bang! that profession disappears in your area (due to technology or globalization, or due to the company being gobbled up in a mega-merger) and you have to spend 4 more years and $100k more to get another $120k job. Also, imagine the stifling impact this has on risk-taking – maybe you want a different job than your $120k job, one you’d like more and be better at, but you have to spend $100k and 4 years to get one with similar income, or you’d have to settle for a lot less money. Seems to me that equality would make things a lot better for everyone, including our economy. Good points and I’m in agreement but there’s another side to the technical coin. A move up the percentile ladder in the US indicates a larger gain in income than an equal move up the percentile ladder in Denmark. Adding that $45,000 to a family’s income will look like a smaller gain (in percentiles) in America than in Denmark, but is it really a smaller gain? To follow up, a gain of $40,000 in Denmark might move a family up farther on the percentile ladder than a gain of $45,000 in the US. In some respects, one could say that on the whole the Danish family has improved more than the American one, but surely in some respects the American family has done better. Without dismissing the human importance of both relative and absolute gains, I would stress the relevance of the mobility figures for equality of opportunity. The less intergenerational change there is in percentile rankings, the more difficult it is to believe that everyone is starting out with roughly equal chances. As I understand it, many conservatives who reject what they call demands for equality of results nevertheless support equality of opportunity. The argument actually being sold is more pernicious. It’s a variation of trickle down, that making the rich much richer will raise all the boats – or at least the boats society should care about, meaning those who work hard and not those labeled “undeserving”. In this vision, what matters is not how rich the rich are but how rich everyone is. It’s a neat idea except for the way facts contradict it. It allows these people to say “class warfare” holds America back. They can use the argument that wealth is not a “zero-sum game” to be “redistributed”. It allows them to argue the real enemies are things like inflation because inflation makes whatever you have worth less if it doesn’t grow fast enough. The argument becomes that inflation is the problem because everyone would have more if not for the decline in value. They can argue that mobility doesn’t matter if everyone has enough. Doesn’t matter that everyone doesn’t have enough, because they can point out that poor people have phones and TV’s so it looks like they have enough. They can point out that state schools don’t cost all the much for college so there really is no excuse. I remember when Warren Buffett supposedly told the employees at the Buffalo Evening News they didn’t deserve a raise because the rise in value wasn’t due to them but to the economy as a whole. Funny how that works: the employees suffer when the business turns down but when it does they don’t luck out. While I fully agree with the basic point, I do want to point out that the graphic is still misleading – income distribution is not at all a Gaussian normal distribution. Even plotted on an appropriate log scale, social safety net programs truncate the lower tail, and the big winners extend the upper tail dramatically, and most people assume a linear scale unless otherwise told. The inequality blocks get a lot longer at the top end, and I strongly suspect that most of the touted mobility is within the lower quintiles. It’s much harder to go from the 95% mark to the 99% mark than from the 35% mark to the 40% mark. I feel like that technical point is the least interesting argument for reducing income inequality, maybe even to the point of wanting to filter out its effect on the inequality statistics. As Alan and pjr say, absolute gains are important. I feel like relative gains are a gross approximation of wealth-correlated social classes, and absolute gains are pretty direct metrics of material welfare. Obviously, there is value in transitioning from a more marginalized, worse served social group into a better accepted and served one, but those gains are only correlated to the increases and decreases in relative wealth. Furthermore, their value is harder to quantify than the increased buying power of absolute wealth increases.